Mantis shrimp [Lysiosquilla scabricauda]are marine crustaceans and are classified into 2 types, Spearers and Smashers. Found mainly in shallow (10m to 40m) tropical and subtropical regions, they have a variety of colors (dull to multi-colored) and sizes. Spearers are armed with spiny appendages topped with barbed tips, used to stab and snag prey. 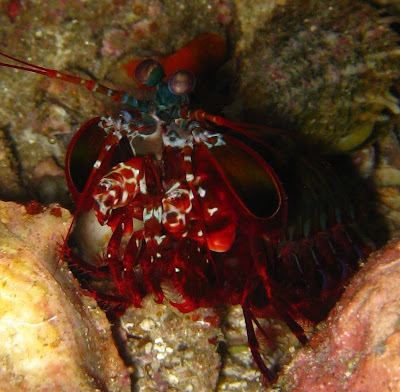 Below is a picture of the Giant Spearing Mantis Shrimp found in Similan Islands, Phuket. Smashers, on the other hand, possess a much more developed club and a more rudimentary spear (which is nevertheless still quite sharp and used in fights between their own kind); the club is used to bludgeon and smash their meals apart. 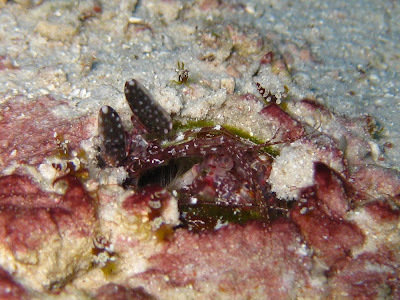 Below is a picture of the Peacock Mantis Shrimp, found in Richelieu Rock, Phuket. For smashers, the claws are employed with blinding quickness, with an acceleration of 10,400 g and speeds of 23 m/s from a standing start, about the acceleration of a .22 calibre bullet!! Because they strike so rapidly, they generate cavitation bubbles between the appendage and the striking surface. The prey is hit twice by a single strike; first by the claw and then by the collapsing cavitation bubbles that immediately follow! That the pistol shrimp also uses a similar technique to stun its prey - by snapping its claws at such speed that it sends a shockwave!! Mantis Shrimp love burrows and crevices, which they inhibit. Not often seen exposed fully in the open water, they scurry quickly across the terrain or, at times, stay really still to observe their surroundings. Mantis shrimp appear to be highly intelligent. They are live for long periods of time and exhibit complex behaviour, such as ritualised fighting. Some species use fluorescent patterns on their bodies for communicating with their own and other species. They can learn and remember well, and are able to recognise individual neighbours with whom they frequently interact via visual signs and smell. Many have developed complex social behaviour to defend their space from rivals. Perhaps most interestingly, mantis shrimp have an aggressive nature and hunt with lightning quick reflexes (as shown in the video below). That the mantis shrimp are able to see a wide range of colors as they have 16 different photoreceptor types (even more than a human who has only 4 receptors!!). Their eyes are even able to sense the size of the tide and are said to be the most complex eyes in the animal kingdom! During mating rituals, mantis shrimp actively fluoresce, and the wavelength of this fluorescence matches the wavelengths detected by their eye pigments. Females are only fertile during certain phases of the tidal cycle; the ability to perceive the phase of the moon via their eyes may therefore help prevent wasted mating efforts. Most mantis shrimp live alone, but males and females will come together briefly only to mate. Males and sometimes females will actively seek a mate. Males perform elaborate mating behaviors to attract the attention of the female. Females will accept one or more males as mates during this time. In a few species, males and females mate for life, a period that may last 15 to 20 years. These life-long mates share one burrow. The females tend to the eggs, while the male hunts for himself and his mate. Males and females mate belly to belly. Males deposit sperm directly into the female where it is stored in a special pouch just inside the opening of her reproductive organs. The eggs are fertilized inside her body just as they are being laid. The eggs may not be laid right away. The female may choose to wait until ocean currents are available for dispersing the eggs. Eggs are glued together in a mass and take anywhere from 10 days to two months to hatch. During this time the female carefully tends to the eggs and is guarded by the male. The hatchlings may leave the burrow immediately, or remain in the burrow for a week to two months. Now you know more about the awesome Mantis Shrimp!